The modern demise of the family dinner is much bemoaned these days. But how long has this really been a tradition? When did it start? Why did it happen? These and other questions are answered in fascinating detail in Three Squares. 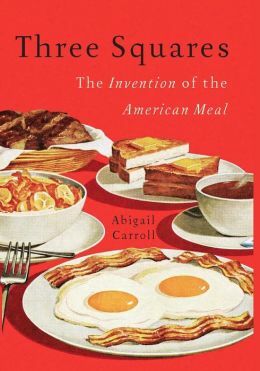 Caroll takes a historical view of thr American meal, beginning with pilgrim pottages and moving thru Victorian dinner parties and factory lunch pails to TV dinners and our current dinner habits. She draws on first-hand accounts of recipes and menus for a glimpse into what was considered acceptable dining across centuries of American gastronomic history. This book gives a broad view of dinner’s development, illustrated with many interesting details. For example, did you know most pilgrims would’ve subsisted largely on one-pot meals of grain, suet and greens all boiled together (sounds awful!) Or that Thomas Jefferson was considered a bit odd for the variety of fruits and vegetables he grew at Monticello? Victorians threw elaborate dinner parties as measures of class and wealth but believed enjoying food too much was a moral weakness. Up until 100 years ago, steak was a popular breakfast food. All of these facts and more fit into an informative big picture story. Along the way, Caroll also writes about the roles of women/housewives towards food preparation. Our ideal of Mom making dinner for Dad when he comes home from work and the kids when they come home from school is actually a relatively recent concept, albeit a logical conclusion of the past 300 years of eating habits in America. I highly recommend this book to anyone who likes food or books about food- or is just curious and wanting to learn something new. I certainly learned a lot, and enjoyed myself in the process. Now let me make myself a snack…. You might like: Omnivores Dilemma, Michael Pollan. At Home, Bill Bryson. This entry was posted in Non-Fiction and tagged American history, book review, food, non-fiction. Bookmark the permalink.